In recent years, sports facilities, health clubs, and fitness centers have become multi-use complexes with increasing personality and architectural flair. Designed to combine exercise with social opportunities, modern sports centers can accommodate multiple different athletic activities, while also providing safe, comfortable, and enjoyable social venues for local communities. Flooring plays a key role in achieving all of this, as it has a big influence on the overall functionality, sustainability, and aesthetics of the space. Therefore, it comes as no surprise that all contemporary trends in sport and fitness flooring focus on greater flexibility, increased safety and comfort, smaller carbon footprint, higher aesthetic appeal, and enhanced personality. If you’re designing a new facility or renovating an existing one, you’ll probably want to keep pace with the popular tendencies. 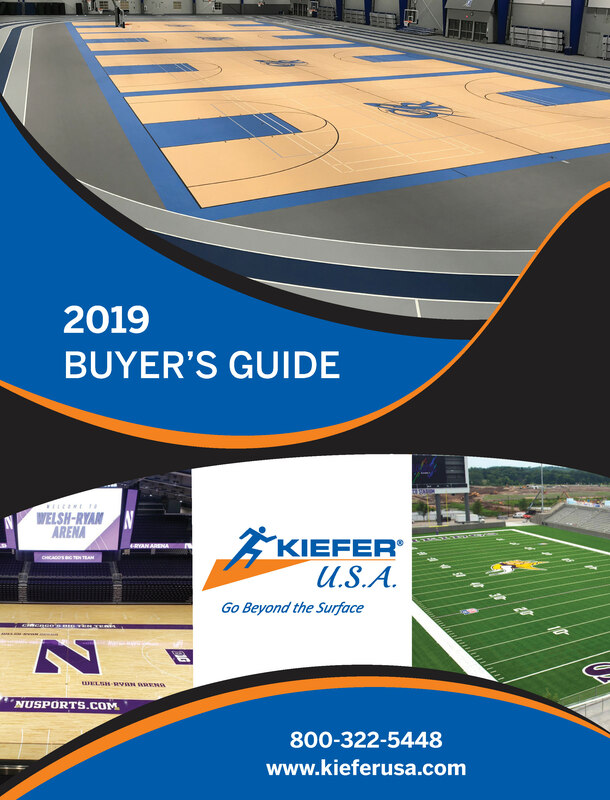 Here are some of the most prominent sports flooring trends to consider in 2019. Environmental concerns – In compliance with the growing trend for green architecture and use of natural materials in buildings, sports facilities throughout the country are incorporating more and more green features in their design. Eco-friendly flooring is key among them – not only is contemporary sports flooring made of recycled or renewable flooring products, but special attention is also given to low VOC adhesives, green maintenance products, and minimal refinishing requirements. In addition to the above general trends, there are some specific sport and fitness flooring tendencies that are likely to gain popularity in 2019. 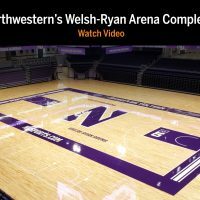 The biggest trend in contemporary sports flooring is the incorporation of synthetic flooring in all kinds of athletic facilities across the country. 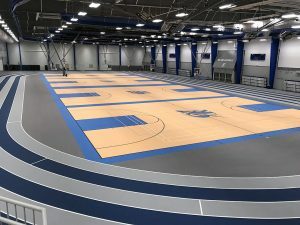 Synthetic floors have many great benefits – durable, resilient, versatile, and easy to install and maintain, they’re well suited for various athletic activities, like tennis, volleyball, hockey, etc., while also being able to withstand years of intense foot traffic and communal use. Synthetic surfaces are safe and comfortable and can last decades before they need to be replaced. Whether it’s rubber flooring, urethane floor systems, or vinyl tiles, synthetic surfaces provide excellent protection to athletes and exhibit tremendous elasticity, tensile strength, and tear strength. What’s more, they’re aesthetically pleasing and highly customizable. Each floor has a unique look to it, represented by different colors and logos. Synthetic flooring requires minimal maintenance – it should be cleaned on a daily basis (damp mopping with a citrus-based cleaner is enough to keep it in excellent condition), but doesn’t require annual resurfacing or polishing, which saves plenty of time and money. 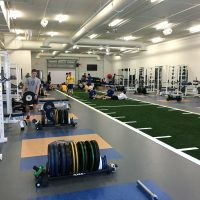 Another prominent trend in modern sports flooring is the increased demand for artificial turf –it looks, feels, and performs like real grass, allowing users to practice sports like football and field hockey that were previously reserved for outdoor courts in the safety and comfort of an indoor sports facility. 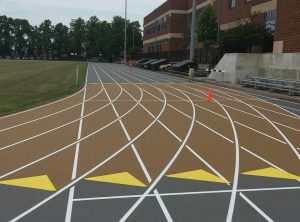 The introduction of sprint tracks that can be enhanced with the use of floor markings to indicate distance, start and finish lines, and even separate track lengths is also emerging as a popular trend in sports flooring. Bolder artistic designs and more exotic color schemes meant to boost the aesthetic appeal of the sports complexes and give them unique character. 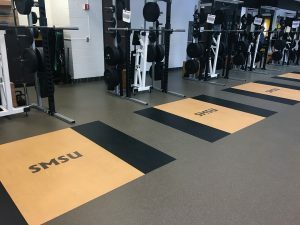 Inlaid platforms consisting of rubber flooring between two crash mats that provide a safe, comfortable surface for weight-lifting and eliminate the need for raised platforms in weight-rooms. 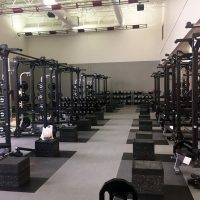 The level surface gives a lot of advantages to a weight-room – it reduces the risk of injuries and allows for easy movement of equipment and easy cleaning. If you’re looking for durable, high-performing, and cost-efficient flooring solutions that are in pace with the latest trends in sport and fitness flooring, KieferUSA is the company to call – we offer the most innovative and efficient sports flooring options available on the market and have the rich experience, specialized equipment, and professional know-how to help you create a beautiful, safe, and comfortable multi-purpose sports complex, fitness center, or health club. All you need to do is give us a call at 800-322-5448 – your project will be taken care of from start to finish and the results will be truly impressive. 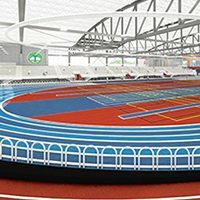 Kiefer USA will install the Mondo variable banked hydraulic track system.